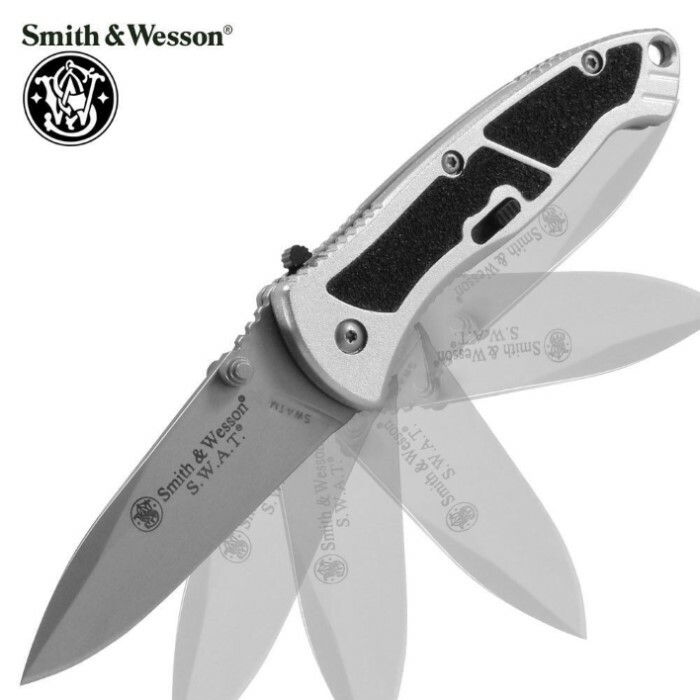 Smith & Wesson SWAT Assisted Opening Pocket Knife | BUDK.com - Knives & Swords At The Lowest Prices! Enjoy Smith & Wesson quality in the Smith & Wesson S.W.A.T. assisted opening folding pocket knife, featuring a serrated 4034 stainless steel drop point blade with a T6061 aircraft aluminum handle with black rubberized inserts. Smith & Wesson's M.A.G.I.C. assisted-opening mechanism proples the blade open at an astonishing speed, giving you a serrated assisted-open folding pocket knife you can count on. I've had this knife for over 2 years now, and I love it. It has great heft, the blade opens quickly and has an easily accessible lock. The blade stays sharp, very nice build quality. I paid around $35 for mine back then, and it's worth every penny. I bought a second one for a friend, and I'll be buying another one in black soon. The ONLY complaint I have is the stupid screws for the pocket clip keep coming loose. But, you'll find that problem in just about every folder. I purchased this blade from a small business for alot more than it is worth, it cost me 89.99+tax. It is a great blade and all, but after a while I started having trouble. First, the small black lever for the one handed assisted opening mechanism broke. This was a minor thing until I needed it out in the field with gloves on. This was annoying. Soon after, I started to notice screws missing in the handle. They fell out about two screws per month. Soon the blade shot out of the handle and i decided to call it in to S&W. I do suggest this blade, but be advised not to rough it around too much. Editor's Note: Thank you for your comments. We have updated the review to reflect the appropriate spelling.